Imagine, you have just been diagnosis with ALS. Doctor says you have 5yrs to live. You know that you will have a power chair when you are to weak to move on your own. You know that you will always be able to communicate through a computer. You know that eventually a compact portable ventilator will breath for you when your diaphragm becomes to weak to pump your lungs. You are more horrified when you find out you will eventually have to live in a nursing home or chronic hospital, sharing a tiny room with maybe one or two other people. Although you will be kept alive with all the technologies, you will have no choice but to live in your bed, and be left staring at the ceiling. You will be kept alive but with no life. Perhaps this is why approximately 5% ALS patients choose to use a ventilator to prolong their life... Our society treats prisoners with more dignity and respect than the chronically disabled, whom are kept alive but with no life. We provide the world’s leading EyeTracking technology to you as a device manufacturer. We will enpower you to do what you never thought possible. We will help your doctor see through your eyes. Eyetracking is a technology that puts you in control of your device by using your eyes as you naturally would. A device or computer equipped with an eyetracker “knows” what you are looking at. This makes it possible for you to interact with computers or anything that runs on electricity using your eyes. Building a simple solution to solve everyday problems for people with disabilities is easy. Building a simple solution that works on consumers around the world is not. Once we have our first EyeDrive Build, we will let patients living in nursing homes and chronic hospitals drive it with their eyes. This will create demand and initiate sales and raise donor and shareholder interests. We will make a video of our successes. We will sell the first chair for $13720. Hopefully this will pay for 2 more EyeDrive Builds. Imagine this scenario. You had a stroke and lost the ability to speak but you are completely aware of everything around you. You can hear, you can see, you can remember people faces, you have memories, you can cry, you can not move, and you can not tell people what you want or need. Since you can not speak, you can not answer questions on the Mini–Mental State Examination (MMSE) or Folstein test that can prove that you are sane. So, you are diagnosed as possibly locked in syndrome and left in bed, staring at the ceiling. Since we have a laptop, at this time, we don't need monies to develop this challenge. Once we have our first EyeMMSE software Build, we will let dementia patients living in nursing homes and chronic hospitals test it with their eyes. We will also show doctors, nurses, occupational therapists and get feedback. This will initiate sales and donor and shareholder interests. EyeTracking HealthCare Tech is a subdivision of the EyeTracking HealthCare Organization*. We truly enjoy creating technology that allows for natural human-computer interaction. By trade, we are developers, designers, engineers and makers. 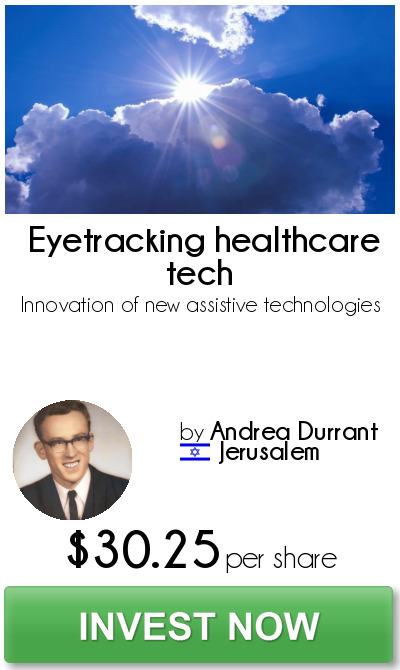 EyeTracking HealthCare Organization connects EyeTracking HealthCare Techs with people with disabilities to create extremely affordable solutions for everyday challenges facing people with disabilities. Intellectual property is a central tenet of EyeTracking HealthCare Tech and development strategy. The total number of shares, which this project is authorized to issue is three thousand and fifty-four (3,054), each with a par value of $2.00 USD.